Music streaming service MOG has today announced that its monthly average users have hit the 160,000 mark, which is up 264% for the month of October. This is undoubtedly due to a boost from MOG’s partnership with Facebook’s new music streaming initiative. As a feather in its cap, MOG also increased in users faster than other music services like Spotify and Rdio that also integrated with the Facebook Platform at the same time. MOG launched a free version of its service in September, allowing Facebook users access to its 13M songs without a membership fee or music client. This lowering of the barrier of adoption likely was the source of its higher usage rates. If it costs nothing, either in terms of money or time, to sign up and use the service, why not? David Hyman, CEO of MOG, calls Facebook the “best distribution platform we’ve ever had,” and says that MOG expects exponential growth to continue. 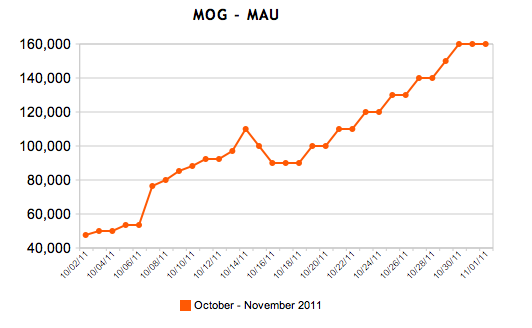 The data from Appdata.com indicates that over the last week alone, MOG has seen a 33% growth, and that its monthly growth is faster than Rdio, at 64%, and Spotify, at 35%. If you still can’t decide which of the music streaming services is for you, be sure to check out our comparison of Rdio, MOG, Spotify and Grooveshark.